The ladies of the Quilters Guild of the Southern Crescent have a big heart for community service. These wonderful women are helping struggling families in our local community by generously donating a beautiful quilt to the upcoming Harvest for Hope Real Life Gala silent auction. Quilters, Laura Wheater and Evelyn Tomlinson did a large part of assembly on the quilt along with the hands of several other greathearted women. 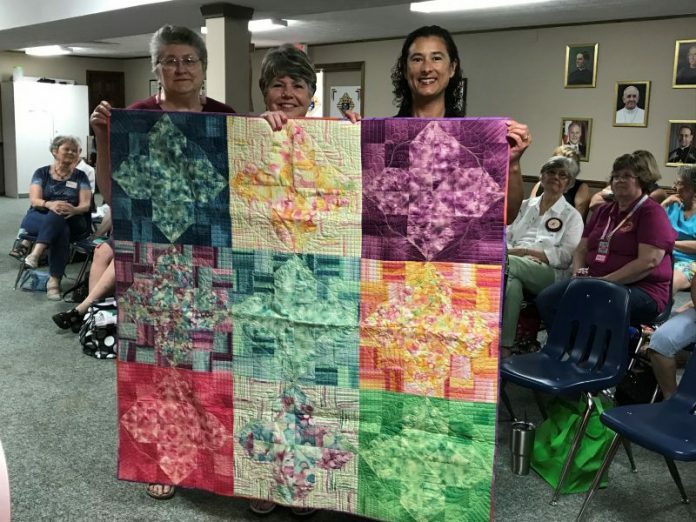 The Quilters Guild of the Southern Crescent is a group of people who get together for fellowship, education, community service and sharing the pleasure of quilting. Anyone interested in quilting is welcome, whatever their skill level! The Real Life Center staff and volunteers appreciate their thoughtfulness and know someone will be very blessed to purchase this lovely quilt Sept. 20. The Real Life Center is a non-profit organization serving permanent resident families in Fayette and Coweta counties that are going through difficult times. The Center seeks to provide a “hand up” rather than a “handout”. It offers a one-year program designed to help families get back on their feet and to encourage them to set goals that will help promote long-term change.